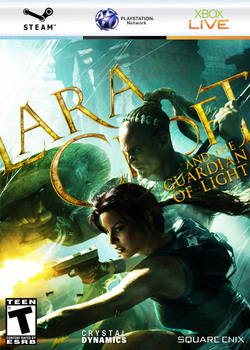 Lara Croft and the Guardian of Light is a game featuring Lara Croft, but it's not part of the Tomb Raider games, franchise. This game can be played also online or offline with a friend in a multilayer edition where Totec, the guardian of light joins Lara to defeat Xolotl, and return the "Mirror of Smoke" which will once again lock Xolotl and his powerful army. The puzzles are way more clear and easy, players get to aim with their weapons, the camera is above the characters, but the temples and enemies, are once again epic and never to be forgotten. The game sold 98,000 copies for Xbox in it's first 6 weeks showing the success of a small game such as this, a lot dislike it because of the controls and view, and other stuff, but it's great in every light and let's not forget that Crystal Dynamics and Square Enix had limited time to do this game in the 2010.